THERE were two circuses this week to appease a populace that might otherwise complain about the shortage of bread. One was the media circus surrounding the birth of the royal baby; the other was the media circus surrounding the first media circus. While millions of people all over the world – all over the world – waited excitedly for yet another announcement that there was no news, the people bringing us that absence of news grew increasingly embarrassed. The most that would happen in this case was that a baby would be born – healthy or otherwise, a boy or otherwise – and would be given a name. At best, it was only ever going to be a good news story which, as news people know, means it’s not really news at all. And for every keen royal-watcher anxiously tuning in for harmless news of centimetres and kilograms, there was a republican (both kinds) lamenting the extent of the coverage. Even the Guardian had a button prompting ‘Republican?’, which you could press to filter out the royal content – though that would rather spoil the fun of leaving outraged comments about it. Predictably, that was nowhere more true than in this country, where the shame of enjoying the spectacle presented by royalty is so deep and old and complicated that hardly anyone admits to it, other than women of a certain age who still never go anywhere without a hat and who apologise to no one, thank you very much. For the rest, it was a case of hastily switching over to Ros na Rún rather than be caught royal baby-watching and have to explain yourself. There are many reasons for this shame, and we heard them all this week. Naturally the ‘Was it for this…?’ brigade were there, ranting and fuming about British imperialism in their Premier League t-shirts. 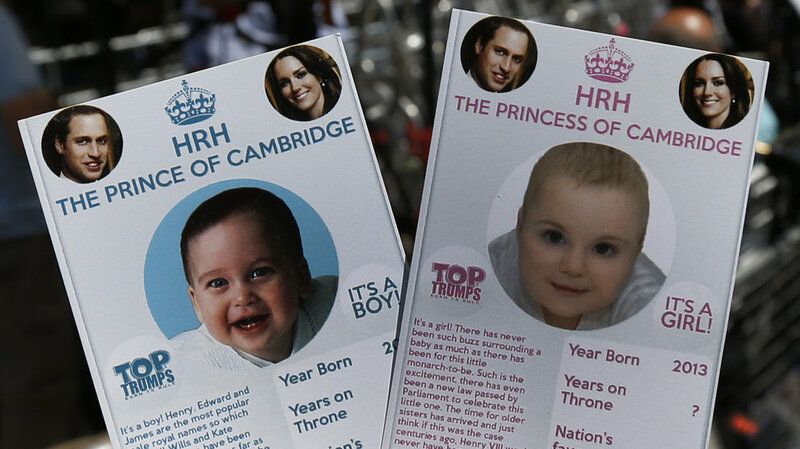 There was a lot of hand-wringing comparison between the royal baby and other children born in the world that day, and their lives and their life expectancy. There was the usual weighing up of the cost of the royal family, though that needn’t concern anyone outside the UK, since we get to enjoy all the pageantry of the British royals without being put to the trouble of paying for any of it. In fact, the whole of that secondary media circus – the media circus surrounding the media circus – seemed calculated to make everyone feel guilty. What a downer. The truth is that, while the shame of being a royal-watcher may be complicated, the fascination is not. In an age when prying brazenly into other people’s lives is the number one televised sport, the British royals represent a welcome difference. Unlike the participants in reality television, the royal family don’t project their feelings all over you. They remain serene, mysterious, allowing you to project your feelings all over them instead. Certainly since Princess Diana took what remained of her secrets to the grave, we’ve known very little of what these people are really like, or what’s really going on behind the toothy grins and the improbable hats and the not-very-attractive faces. There lies intrigue. You get to use your imagination. Less of a circus then, perhaps, than a dumb show, but nothing to be ashamed of. Let’s stop apologising.